Garret Linck is working on habitat conservation and restoration in the California wilderness as the Paul Siegel Salmon Restoration intern. It’s hard to believe that I only have two and a half weeks left working for the Mendocino Land Trust. I’m nearly finished with one of the largest projects I’ve been working on this summer: a management plan for the Noyo River Redwoods Property. In my last post I mentioned the salmonid habitat surveys I was conducting in the Noyo River with Doug. This property lies along that same river, but further inland in eastern Mendocino county—near the city of Willits. 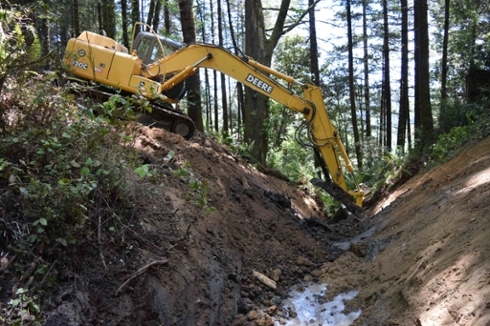 The 426-acre property was purchased for $7.5 million in 2011 by Save the Redwoods League (a non-profit organization that protects and restores coastal Redwood forests), before being sold to the Mendocino Land Trust in 2012. Hello from the Northern California wilderness! This past week and a half has gone by so quickly. The first thing that struck me was the natural beauty of this area. Every morning I get to run on the trails behind my cabin in Russian Gulch State Park, then I visit the beaches each afternoon. I can hear sea lions from my campfire spot, and see great blue herons on my way to work. I spent most of last week settling into the office and meeting all the wonderful people who work here. I also got to tag along for a few bird surveys, which the Mendocino Land Trust is conducting with the help of some volunteers. I did manage to pick up a couple calls, and at the least can now distinguish between the chips of a squirrel versus those of a bird (harder than you may imagine). I also went out with a group from the Bay Area who were using their vacation time to do community service (part of a movement called “voluntourism”). They were a really friendly and lively group, and were incredibly helpful in removing the invasive species from the beaches (see photo).